Posted by Jessica Behrman on November 19th, 2018 at 8:00am . Daniel Burman had a prosperous career in real estate but was left unhappy and unfulfilled. In his ATE Success Story, Burman explains how he went to school to obtain an associate degree in applied science for photovoltaics. This, in turn, enabled him to make a career change that allows him to work in the renewable energy sector, make a good living, and find a fulfilling career as a solar energy contractor. In this month’s From the Archive blog post, we’re highlighting the work of three ATE projects and centers that support the education of technicians working in the renewable energy industry. 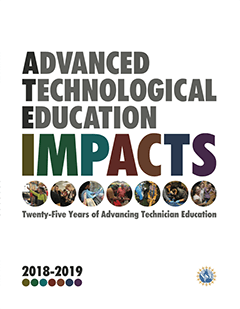 Resources featured include a webinar that discusses the employment trends in clean energy jobs, a report that considers the educational needs of technicians working in the renewable energy industry, and a renewable energy technology curriculum that trains students in four different certificate programs. For more information, explore the links provided below. To find more resources in the ATE Central portal related to education and careers in renewable energy, try browsing by ATE Area: Agricultural and Environmental Technologies -- Energy technologies.